Lowrie will be introduced by the team at a news conference on Wednesday, after which general manager Brodie Van Wagenen will speak to members of the media. 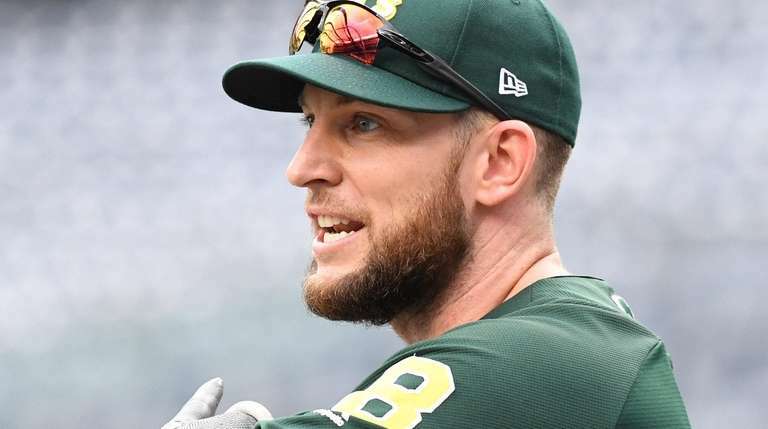 It wasn’t necessarily the splashy signing Mets fans were clamoring for, but the team’s surprising acquisition of Jed Lowrie became official Tuesday, providing them with infield depth and adding to the slew of moves new general manager Brodie Van Wagenen has made in his early tenure. Lowrie, 34, was signed for two years, $20 million and will be introduced Wednesday afternoon at a news conference at Citi Field. That meeting also will be something of a reunion, because Van Wagenen, his former agent, will be there to greet him. Additionally, Van Wagenen will address the media for the first time in several weeks, perhaps shedding some light on the team’s next moves. What also could use some clarity: How the Mets plan to deploy Lowrie, a switch hitter who primarily has played second base, but also has seen time at every other infield position. The team this offseason already traded for Robinson Cano, who’ll play second, and will have to juggle Amed Rosario, Jeff McNeil, J.D. Davis, Todd Frazier, and likely rookie Peter Alonso, along with Lowrie, in the infield. With the A’s last year, Lowrie made the All-Star team for the first time in his 11-year career, and compiled a slash line of .267/.353./.448 with career highs in home runs (23) and RBIs (99). He has a career .262 batting average and .335 on-base percentage. In all, it’s been a busy offseason for Van Wagenen, his first as a general manager. Aside from trading for Cano and closer Edwin Diaz, Van Wagenen signed Jeurys Familia and catcher Wilson Ramos. He also traded Kevin Plawecki to the Indians for righthander Walker Lockett and infielder Sam Haggerty, and shipped three minor-leaguers to the Astros for Davis and infielder Cody Bohanek. He also picked up centerfielder Keon Broxton from the Brewers.